Australia can challenge India for the top spot in Tests when the teams meet for a four-Test series. Mehidy Hasan has become Bangladesh’s highest-ranked bowler in the MRF Tyres ICC Men’s Player Rankings for Test Bowlers after a stellar performance in the second Test against the Windies, which his side won by an innings and 184 runs on Sunday. 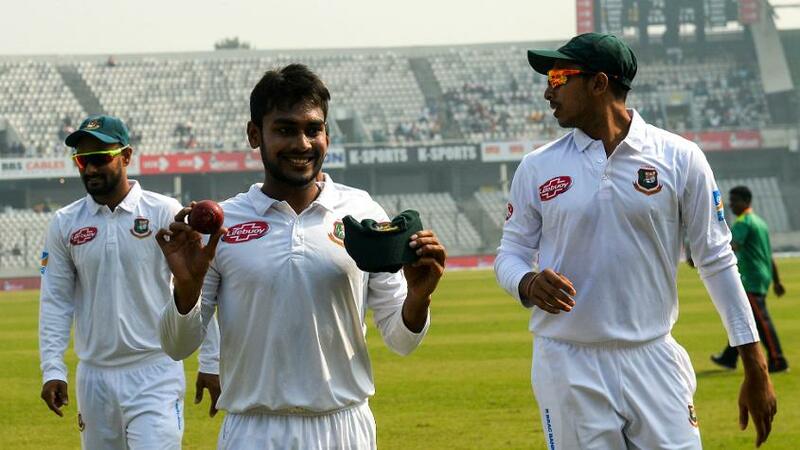 The 21-year-old off-spinner has leapfrogged Shakib Al Hasan (21st) and Taijul Islam (22nd) to achieve a career-high ranking of 16th after his figures of seven for 58 and five for 59 provided him a lift of 14 places. Mehidy, who featured in the ICC U19 Cricket World Cup 2016 held in Bangladesh, had started the series in 28th position, but had slipped to 30th after the Chittagong Test where he had managed only three wickets. Mehidy is the only notable gainer in the bowling table, which is headed by Kagiso Rabada of South Africa, and followed by James Anderson of England and Pakistan’s Mohammad Abbas. Shakib may have lost the status of being his side’s highest-ranked bowler, but he has gained seven places to become his team’s highest-ranked batsman. Shakib scored 80 in his only innings, which has moved him from 28th to 21st position, five places ahead of Mominul Haque, who has dropped two places to 26th position. Following the conclusion of the #BANvWI Test series, find out what's changed in the latest @MRFWorldwide ICC Rankings! Mushfiqur Rahim has plummeted seven places to 28th, but Mahmudullah has vaulted 15 places to a career-high 48th following his contribution of 136 in Bangladesh’s total of 508. The only good news for the Windies was the movement of Shimron Hetmyer. Hetmyer, who led his side to the ICC U19 Cricket World Cup title in Bangladesh in 2016, has leaped 28 places to 52nd following scores of 39 and 93. There is no change to the top-20 batting list, which is headed by India’s Virat Kohli. Steve Smith of Australia and Kane Williamson of New Zealand are second and third, respectively. Meanwhile, top-ranked India take on fifth-ranked Australia in a four-Test series, which starts in Adelaide on Thursday, 6 December. India are on 116 points, while Australia are on 102 points. This difference of 14 points means India are expected to win the series comfortably and their failure to do so will result in the Asian side losing points. If India win the series 4-0, they will move to 120 points while Australia will drop to 97 points. However, if the series result is reversed, then Australia will move into No.1 position on 110 points and India will slip to third on 108 points (0.065 behind England). For India to successfully defend the top ranking, they will have to draw at least one Test. A 3-0 series result in Australia’s favour will mean the Asian side will be on 109 points and the home side will be on 108 points, while a 3-1 series win for Australia means they will finish on 107 points and India will end on 111 points. The Test predictor function is available here, while the latest Test player rankings are available here.